Landmannalaugar - Highlands of Iceland, originally uploaded by skarpi. An aerial view of Landmannalaugar. I noted a flock of sheep on the down right corner, just to show the scale of the landscape. Hekla, one of Iceland's most active volcano; over 20 eruptions have occurred in and around the volcano since 874. During the Middle Ages, Icelanders called the volcano the "Gateway to Hell. 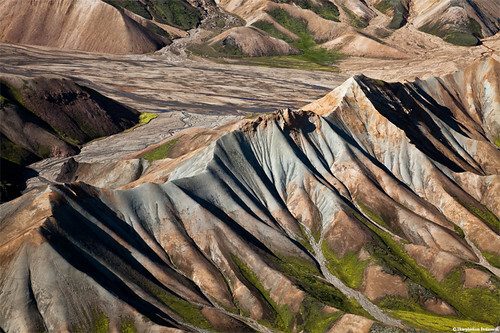 The Landmannalaugar area is a popular tourist destination and the area displays a number of unusual geological elements, like the multicolored rhyolit. The many mountains in the surrounding area display a wide spectrum of colors including pink, brown, green, yellow, blue, purple, black, and white. Two of the most popular mountains among hikers are Bláhnúkur (meaning "blue peak") and Brennisteinsalda. (meaning "sulphur wave").